In many battery powered systems a user would like to know when it was time to replace the batteries before they were completely discharged, causing the device being powered to fail completely. Alkaline batteries have an open cell voltage of about 1.5 volts. As they are discharged, the voltage slowly drops. When the cell voltage reaches about 1.25v, they have delivered about 90% of their stored energy. The circuit below monitors the voltage of two alkaline cells in series and begins flashing an efficient red LED when the total battery voltage drops below 2.5v, alerting the user that the batteries need to be replaced. The circuit takes advantage of some new voltage comparators from Touchstone Semiconductor. The TSM9118 has an internal 1.25v reference and an open drain output while drawing an astoundingly low 0.7ua. 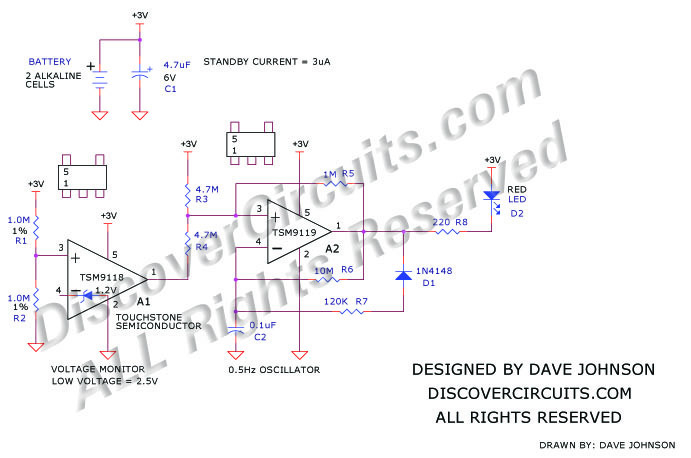 That circuit is configured as a classic voltage monitoring circuit, which changes state at a 2.5v battery voltage. A second TSM9119 Touchstone part is wired as a 0.5Hz oscillator which is configured to produce short 20ms output pulses every 2 seconds. The TSM9119 is a conventional comparator with a push-pull output, which also draws a very low current. Using the two low power parts, the total standby current of the circuit is kept at a low 3 microamps. 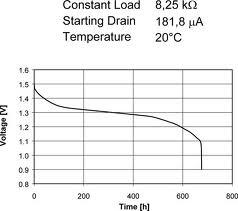 When the LED starts flashing, the average current will increase to about 50 microamps. This is still low enough that the circuit should continue flashing for some time, giving the user time to notice the warning and replace the batteries.